Since 2001, Dicapta has focused on providing people with hearing or visual disabilities an opportunity to have equal access to information. 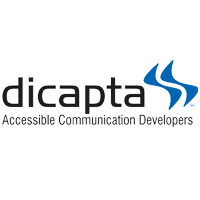 Dicapta specializes in providing services that allow access to audiovisual media. Services include caption insertion (electronic closed subtitles), video description, subtitling and dubbing, live dubbing and CART (putting words into text in real time). Dicapta utilizes cutting edge technology and state-of-the-art processes to provide high quality services in each area.